Former GE Mining boss Steve Sargent: "We often wait for change to hit us rather than being in the engine room making it happen." When giant industrial conglomerate, GE, wanted to design a new bracket for one of its jet engines, it invited engineers from around the world to vie for a $7,000 prize. It was 2013 and GE – in conjunction with GrabCAD – initiated a global 3D printing challenge to redesign the metal bracket to make it lighter while preserving its mechanical properties. Participants from 56 countries submitted nearly 700 bracket designs to Kaggle. The winner was M Arie Kurniawan, an unknown engineer from Central Java, Indonesia, who created a design that shaved off 84 per cent of the weight of the bracket. GE’s jet engines have around 2,000 sensors measuring 5,000 data points per second and 1TB of data is downloaded after every flight. 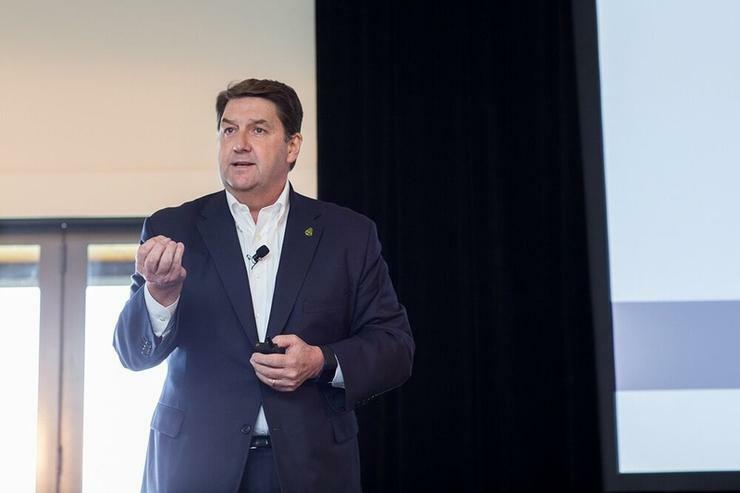 “That data is analysed but even after that, we don’t fully understand it,” GE Mining’s former president and CEO, Steve Sargent, told attendees at this month’s ANZ CIO Forum. To improve its understanding, GE and Alaskan Airlines put a month’s worth of engine performance data out on the Internet and asked people to uncover insights from that information. “We wanted them to tell us something that we didn’t know because we had aeronautical engineers and rocket scientists going through this data all the time,” he said. A team from Singapore won $100,000 for developing an algorithm to helps airlines better predict flight arrival times. The algorithm provided arrival estimates that were almost 40 per cent better than those currently available. This would help airlines reduce congestion at the gate and manage crews more efficiently. It’s this kind of thinking that organisations and importantly, their leaders, need to adopt. They need to reach out to the external world to enable true innovation, Sargent told attendees. “If the future of work is changing – if the way we connect and engage with people and the way we work is changing, the way we lead has to change because we as leaders ... have to transition from what’s traditionally been a ‘command and control’ leadership style to ‘connect and inspire',” he told attendees. Successfully managing behaviours is the key to leadership in this new world, Sargent said. Future business leaders will run ‘values-based’ organisations where they clearly articulate the behaviours they expect, he told attendees. “Behaviours are intangible to people so you have to make them tangible – you’ve got to help them understand what good looks like, what poor looks like, and what outstanding looks like,” he said. Sargent said IT chiefs need to assess performance against these benchmarks. When he was at GE, every 12 months he would get a ‘360-degree’ view of his performance alongside these values from his superiors, peers and subordinates. Sargent also highlighted that there needs to be consequences for inappropriate behaviour in the workplace. “How many times have people who aren’t behaving in an appropriate way but because they are delivering the financial outcomes you want, we let them stay inside the company?” he asked. “The minute you allow that person to continue to behave that way without checking on them, you are making a complete mockery of any values that you have got within the organisation. “Similarly, if people are behaving the way you want, they need to get the promotions, they need to get the recognition,” Sargent said. And in this new ‘connect and inspire’ world, behaviours – how people do things – are just as important as what the company does, he said. Some organisational leaders are making perfectly rational decisions for a world that no long exists, said Sargent. He said Woolworths’ bosses in recent times had enacted well-worn strategies that were not delivering the financial results they wanted. “Their world had changed, in the last 20 years, their competition was pretty weak. Coles was not that effective – Coles has become much more effective over the last decade. And that’s really challenged them – customer perceptions have changed. So you need to really understand what is going on around you,” he said. “We often wait for change to hit us rather than being in the engine room making it happen. You need to be in the ear of your chief executives and your board because you have a closer handle on [the effect of technological change] than anybody. You are seeing it,” he said. Finally, he said leaders of tomorrow will ignite their own growth and suggested that organisations double the percentage of revenue they allocate to research and development. “If your research and development is not in the seven, eight, nine or ten per cent range [of total revenue], you are probably not trying hard enough. You are going to be a victim of change, not an agent of change. Immediately after the global financial crisis, GE increased the proportion of revenue it allocated to R&D from 3 to 7 per cent in one day, he said.